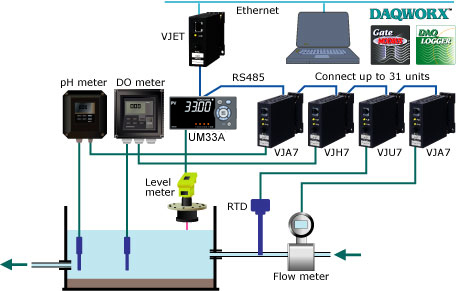 You can build a low cost network-based monitoring system around your existing facilities by adding the VJET RS485/Ethernet converter, VJ series signal conditioners, the UM33A Digital Indicator with Alarms, and other components. Using the DAQWORX Data Acquisition Software Suite, you can easily display trends and other screens on the PC and save the data. The UM33A is a newly-released digital indicator with alarms provides up to 9 alarms outputs and input correction function (PV bias, Polygonal line approximation, polygonal line bias). Also, 24 VDC sensor power supply is available as an option.